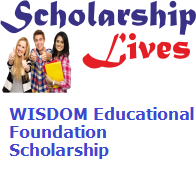 WISDOM Educational Foundation is going to conduct the WISDOM Educational Foundation Scholarship 2019 Examination for mathematics and science conducted in different districts of Maharashtra in the upcoming month. The main objective of this scholarship programme to develop the talent of the students in the field of the mathematics and science talent of students. Students of Class 3 to 8 are entitled to apply for this scholarship. The 1st rank holder will Get INR 2000. The 2nd rank holder will Get INR 1500. The 3rd rank holder will Get INR 1200. The 4th rank holder will Get INR 1000. The 5th rank holder will Get INR 800. The 6th rank holder will Get INR 700. The 7th rank holder will Get INR 600. The 8th rank holder will Get INR 500. The 9th rank holder will Get INR 400. The 10th rank holder will Get INR 300. The 11th to25th rank holders will Get INR 200 each. The 26th to50th rank holders will Get INR 150 each. The 51st to75th rank holders will Get INR 125 each. The 76th to100th rank holders will Get INR 100 each. Total marks will be of 100 marks in total. For mathematics, the time duration will be 90 minutes, while it will be 70 minutes for the science exam. According to the latest official notification, there will be 50 objective-type questions with each question carrying 2 marks for mathematics and 100 questions carrying a weight of 1 mark each for science. The answers need to be noticeable with blue or black ball pen on the provided OMR sheet. All applied candidates can get study material and books to prepare for the exam. The applicants have the provision to apply for re-examination and revaluation of marks for a nominal fee. The passing and merit certificates will be delivered to applicants by 1st August 2019. Take a print out of the application form and fill in the necessary details. Then choose the correct option for the mathematics exam or the science exam or both, and can mention the same on the application form. the fee can also be paid online or by using net banking. The details can be found here.